Ideal for use in Conference, meeting and training spaces. This team optimizes the AV settings and allows the compression of the N1000 series codec can transport SDI video without visual loss with a subplot of 10 ms latency at 60 fps. The encoder AMX N1134A SDI in Harman Professional Solutions It is a solution of IP coding that allows you to do without a converter SDI to HDMI and makes it easier to integrate an SDI source on any platform AV AMX N1000 network. The N1134A optimizes the AV settings and allows that the N1000 series compression codec can transport any decoder N1000 SDI video without visual loss with a latency of subplot. 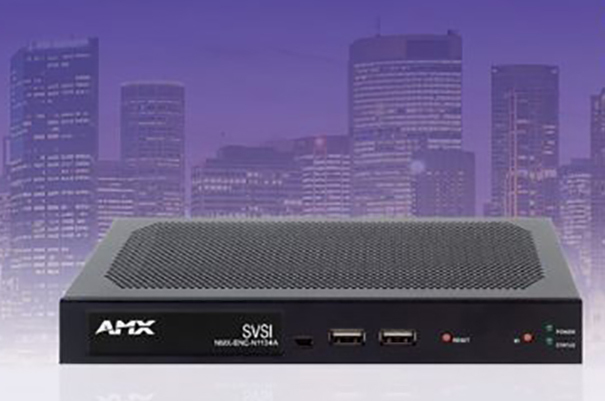 While the majority of the Networked AV solutions with SDI connections operate using H.264 or H.265, introducing a substantial amount of compression and latency, minimum compression of AMX IP format maintains a high quality video and delivers it with a unnoticeable latency. Once on the network, the SDI feed can decode with any N1000. N1134A SDI is an ideal solution for inputs from cameras live, in Conference rooms, meetings at town halls and places of training. Encoders and decoders of the N1000 series are a solution for local switching of AV over IP that compresses the video in a minimally compressed IP format. You can create a solution of any size, from a small switch for submission of 2 × 1 up to a switching matrix of 32 × 32 using network type layer-3 switches. Any source can be sent to one or more screens through its routing through switches layer-2/layer-3 using standard Cat5e cable. N1134A encoder is integrated with systems from AMX control, which also boasts AES-67 for an easy adaptation with a variety of audio devices, including the BSS from Harman, mark distributed in Spain by AVIT Vision. And like the other members of the family of encoders and decoders N1000, available power PoE. The N1134A is the latest installment of the greater family of AV-over-IP solutions in the market that allow customers to send easily media IP for distribution using common managed network switches in any size and configuration with the high degree of flexibility. SDI input - Distributes video from a source SDI using Networked AV N1000 technology without adding a converter SDI to HDMI. Latency of subplot - encoding and decoding combined latency of 10 ms at 60 fps. Ideal for live video content. Minimal proprietary compression (MPC) - MPC algorithm without visual loss applied to all resolutions. PoE Powered - It removes the requirement of local energy supply and accelerates the installation. Power Over Ethernet (PoE) - PoE eliminates the need for power supplies. Native NetLinx - Simplify integration with the AMX control to reduce the cost of installation.